Naturally, there’s a lot of focus on protecting the head when we talk about motorcycle safety. But in addition to a reliable helmet, it’s worth considering the measures that you’re going to employ to protect the part of your body that’s in contact with the road the most – your feet. While everyday, casual boots might offer a degree of protection, they pale in comparison to the benefits of dedicated riding footwear. If you’re in the market for a proper pair of boots (and you should be), here are a few things worth considering before you take the plunge. First things first, you’ll need to work out exactly what you need from your boots. Just like regular shoes, different styles serve different purposes. You wouldn’t wear basketball shoes to run a marathon, and neither should you wear racing boots for an inner-city commute. A touring rider who’s spending a lot of time in the saddle might prefer a pair of street-style boots that maximise comfort without compromising safety. Whereas a rider who often finds themselves off-road and on trails would opt for a dedicated pair of adventure boots. This style often incorporates abrasive-resistant plastic elements that offers optimum protection from any hazard you might come across, like rocks or downed tree branches. But due to their stiff sole unit, it might be necessary to also carry a pair of sneakers to change into when off the bike. If you’re a serious racer, you’ll need something that’s robust enough to handle the demands of the track. When it comes to safety, you want your boot to fit snugly while still remaining comfortable. 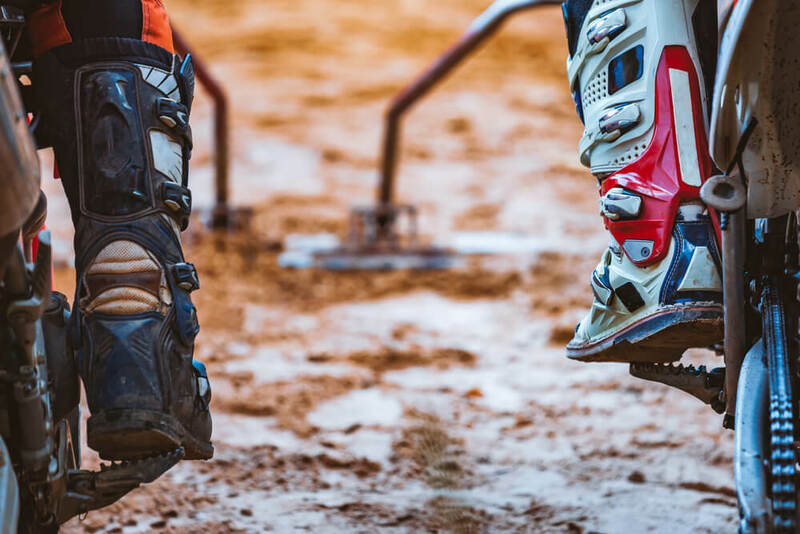 The primary purpose of a motorcycle boot is to reduce the range of motion in your foot that could potentially cause injury in the event of an accident. If a boot is too loose, you run the risk of it flying off after impact. A tight fit is essential to prevent overextension, and the subsequent damage it can cause. If you’re trying on boots in-person, don’t forget to wear the style of socks that you’ll wear riding. You’d be surprised by just how much space a pair of thick wool socks will take up inside a boot. Not all boots are created equal. When considering your options, consider materials and technology that may influence your needs. Look for high quality, thick leather reinforced by double or triple-stitching. Remember, it doesn’t matter how good the leather is if the stitching gets disintegrated by asphalt. If you’re primarily riding in hot weather, look for leather that’s perforated or contains mesh cut-outs. Ventilation will keep your feet cool when you’re on the road (not to mention help cut down on any unpleasant smell when you pull your boots off after a hard day riding). Some shoes may also come adorned with reinforced armour that serves a dual-purpose. They’ll absorb road abrasion in the event of a slide, but they will also help prevent your foot and ankle from being crushed if your bike were to fall on top of you. If you’re riding in a wet climate, keep an eye out for boots that are lined with Gore-Tex – a proprietary technology that creates a waterproof layer that keeps your feet dry. Similarly, consider the material that the sole unit is made from – a Vibram sole is both slip and abrasion resistant. As a general rule, the higher the boot is, the more protection it will offer you in an accident. While short boots are available, and might be aesthetically attractive, unfortunately they’re not the safest choice on the market. A full-height boot will go a long way to protecting your shins and calves from abrasions if they do happen to come in contact with the road. Don’t forget to put your best foot forward. Make sure your bike is fully covered by Swann Insurance, and remember to select extras coverage that ensures that your riding gear is protected as well. That way you get to enjoy all the perks of riding without any of the worries.